There we sat, a group of mothers, waiting while our children sat in story time. A full hour alone without anyone bothering us, it was glorious. We all plopped down, unmoving, and enjoyed the brief respite during a summer break that is already overloaded with fun and the work that goes along with it. I’m not sure how it all started, but someone mentioned something about being at a park and how her child was slightly on the dirty side before coming into the library. She said it quietly, as if it were the most embarrassing thing she’d experienced all day, her dirty child and how she had to wipe the dirt off of her legs before anyone saw her. And then it started, a waterfall of confessions of how dirty our children really are in the summertime. “I haven’t bathed my kids in two days,” said one mother. Personally, we were on day five for actual baths, but I didn’t bother to mention that I count an hour in a sprinkler as a good-enough shower. “I had to scrub down her legs twice today because we were playing outside before we went to the park for lunch,” someone confessed. I chimed in again, admitting that my son’s nails haven’t been white for months. As things go, there are power in numbers and certainly solace in knowing that you aren’t alone in fighting the battle of dirty summer children. Suddenly, all together, we weren’t feeling so bad that we strive for simply “the illusion of clean” during the time of year when kids are, well, kids from dawn to dusk. But here’s the kicker: we’re actually helping out our kids by allowing their mud-stained legs and dirt-smeared faces. Hooray for us! The article goes on to say that our children are becoming too clean and that in order to help this generation with their immune and digestive health, they should do things like walk around barefoot in the dirt, not over-wash their hands, and refrain from frequent bathing. Call me crazy, but I think if a child ever gets their hands on this information, grand happiness will ensue. In all, let this be a lesson to mothers everywhere. You are not alone! There are plenty of us out there attempting to cover-up the film of filth that has accumulated on our children since the day the last school bell rang. Our showers are all dry, our shampoo bottles are full. Our floors are covered in mud and our children’s feet have been caked with dust and dirt for weeks. There’s no longer a need to hide the fact that we are good mothers, that our slacking in the bathing and cleanliness department is nothing more than a way we express our general affection and care for our children’s well being. We love, and therefore, we dirt. These were my words to a friend while discussing what one wears to such an event. 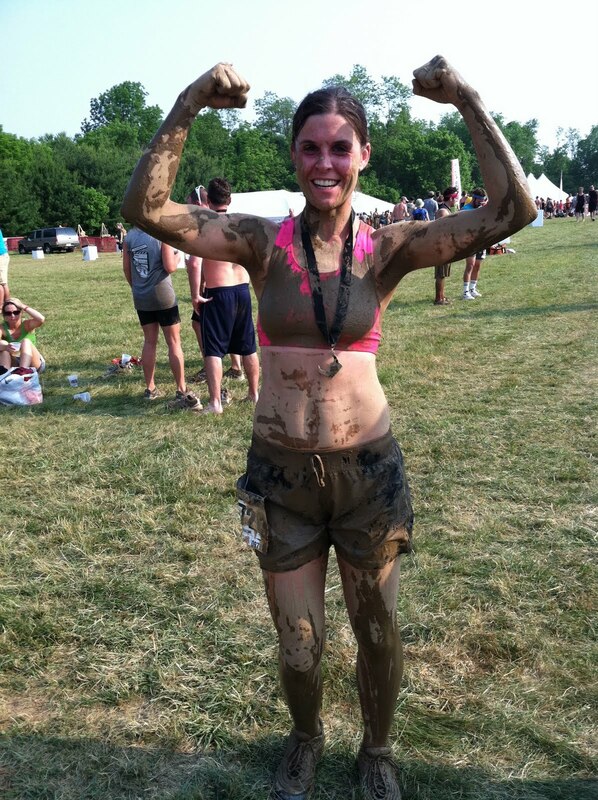 “Not only is it the color of misery, but I’m guessing the mud won’t stain, and neither will my sweat and blood.” I was feeling pretty proud of my forward thinking. my better judgment, is a new craze in the running world. Not at all for charity, this race actually costs you hard eared money, leaving you thinking somewhere in the second mile why you would pay someone to beat yourself up so very much. A three-mile course spotted with numerous obstacles, thousands of people line up to test their warrior skills and see if they can prove that they truly deserve the fuzzy Viking helmet you are given when you register for the race. mes are welcome. I personally opted for regular running clothes as they were practically a costume to me. Generally speaking, I am not a runner. And while standing there waiting for the flames, I did my most training, running my mouth at my husband who signed me up for this ridiculous race. Being a busy mom who spends a large portion of her day driving kids to and from events and yelling at them to hurry up or standing next to a stove making dinner, I didn’t have a heap of time for preparing for this thing. “I’ll start running next week,” I kept telling myself. And then, suddenly, it was the day of the race. Oops. But then the flames went off and adrenaline started pumping and I went on to have more fun packed into three miles than I have ever have before. The pond swim, through murky water and over strategically placed logs. The junk cars, to climb over and through open doors. The 20-foot high cargo net to climb over and down, which thankfully I didn’t have time to think about because my body had already gone into autopilot. I think if I had taken even a split second to look down, I might still be up there, gripping on for dear life and listening to people calmly try to help me to the ground. The tunnel of terror, a very low tunnel that you have to crawl through on your hands and knees, over dirt and rocks and strategically placed roots. I think it was at least four miles long (in a three mile race) because it was the worst part of the whole event. And I had the bloody knees to prove it. There was the rappelling wall, the creek run, the planks to walk across, and more. All mere child’s play compared the grand finale, which was – and I’m not making this up – jumping over fire and crawling through mud under barbed wire. Covered head to toe in Ohio’s finest clay-rich mud, my white teeth blazed like beacon in the night as I spent the next good hour smiling and enjoying my new rank as a bruised and battered warrior. My fuzzy helmet has since gone to the dress-up bin in our basement. I decided to not keep it as a trophy, mostly because I’ve already signed up for the next race. Visit www.warriordash.com just for kicks. It can start from something as a tiny spark caused by two sticks being rubbed together, but if I’m being less poetic and more realistic, there is probably a good squirting of charcoal lighter fluid and a wadded up piece of newspaper. Maybe even this very piece. But it all ends up in one, glorious finale of flames. 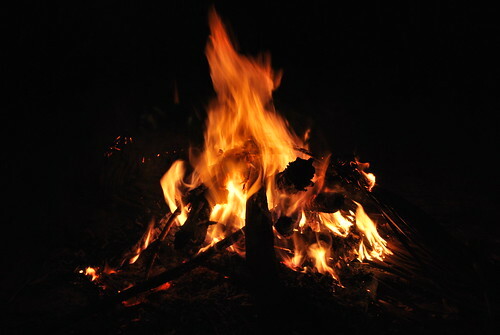 The campfire. The same random dancing orange and red flickers that arise out of a mere pile of sticks and logs. For centuries, these same images have brought people together and been a source of warmth, food, poetry and song. The same warm figure in the evening light has made cavemen scream, cowboys eat, and certainly have toasted a few gazillion marshmallows. Surely something so ancient has wisdom in its midst, right? The campfire has a lot to teach us, if only we’d put down our weenie roasting sticks and listen. What a better world this would be if we all took a few tips from the fire pit. 1. Warmth will bring people together. Whether it’s the dead of winter or the height of summer, not many sights can cause people to plop down in their lawn chairs and test the heat by flashing their palms up to the fire to test the heat. 3. Smoking is bad for you. There is probably nothing more that will send the gathered people running than a low-lying smoke, despite the folklore tricks of shouting “white rabbit!” three times to make the smoke change direction. The folklore doesn’t work well with tobacco smoking, either. Unfortunately. 4. Fire rings are not a shoe rest. Put things where they belong, no matter how convenient it might seem. We all have a pair of sneakers with a melted toe or a line burned across the middle, do we not? 5. Be the brightest light you can and you will be surrounded with friends. We all know that moths are attracted to the light, and some even poke fun at their tiny insect brains acting so automatically against their will. But we’re not much different. If you light it (or be the light,) they will come. 6. Tinder, then kindling, then fuel. In life, you’ve got to start small before you can grow. This even helps when you douse a hefty log with charcoal fluid. 7. Popping wood and spinning tales beat out a wide screen TV more often than not. More mesmerizing than you’d guess, the best stories and the greatest laughs are heard while gathered ‘round the fire. Such pure joy rarely comes from a two dimensional electronic source. Plus your clothes won’t have that sweet smell of wood smoke in the morning. 8. Know your boundaries, and don’t let your flaming limbs fall where they shouldn’t. That whole look-but-don’t-touch thing goes both ways. 9. Be honest and real, and you will bring out the true nature of those around you. Raw and as instinctive as the moth, you can’t help but be yourself when next to a fire. The best example is a little boy. Even the most well-tempered angelic child will find it impossible to not put a stick in, catch the end of fire, and run around with a lit “torch.” Instinctively, his parents will yell at him. 10. And finally, don’t go to bed if you’re still all aflame. So the next time you bring out the bag of marshmallows and gather wood, think of how much smarter and better you’ll be, and what a gift you are giving those around you. Maybe you’ll even be smart enough to save this piece of paper, instead of crumpling it up and squirting it with flammable liquid. The Wilderness Center Podcast and ME! I am proud to say I was interviewed for a wonderful podcast program by The Wilderness Center. Click HERE to listen! Beep…beep…beep…Attention children: We interrupt this summer break to bring you an important message from the out-of-doors. Please close your laptop, turn off the television, relax your texting thumbs, unwind your fingers from their clutches of the video controller, and listen carefully. It wasn’t long ago that your parents spent their entire summers outside, from the time they rolled out of bed and did their chores until the streetlights came on and the voice of their parents yelled their names through the streets. Chances are your parents did not have the electronic luxuries that you have today, and playing outside was the best way to stay out of their mother’s way so that she wouldn’t wring their necks for pestering her and constantly making a mess. So out the door they went. And when it came to playing outside, there were very limited and, dare I say, archaic toys. We had no Ripstix, we had really funny looking scooters. There was no fancy colored sidewalk chalk. Our jump ropes were made of, get this, rope. Either that or these little plastic tubes that would squeeze your skin no matter how hard you tried to avoid it. Our shovels and pails were made of metal, our swingsets puny and rusty. Everywhere you looked was today’s version of a health hazard. We had bats and balls, of course, but not nearly the selection of today. Frisbees came in one style and our bikes all had banana seats until that glorious day we graduated to the infamous ten-speed. The chains of the bikes always came off and pinched our greasy hands when we put them back on. The only way to get the grease off was to borrow somebody’s dad’s Lava Soap and scrub it off in the garden hose, which was convenient because after all that work, we were all probably thirsty. And here’s the crazy thing: We. Had. Fun. We had fun despite the lack of handheld electronics, cell phones, digital cable, virtual worlds, and a garage full of the latest and greatest bike/toy/ball/etc. We created our own virtual worlds built out of sticks and cardboard boxes, and if you wanted to talk to someone you did this really wacky thing. You rang their doorbell. When it came to games, we played things like tag which required us to exert ourselves and run rampant through the yard. We also chanted jump rope rhymes (including some that wouldn’t be so appropriate today) and drew elaborate hopscotch courses on our driveways with rocks instead of chalk. And that brings us to the take-home lesson of this public service announcement. Hopscotch. Most of you reading this have seen a hopscotch course but have only hopped through it without ever knowing how to play the actual game. For your turn, you must throw the marker into the #1 square, landing completely inside it. If it does, great. You now start hopping on each square except the one with the stone. When you get to the top of the course, turn around and hop back, again avoiding the square with the stone but picking it up before returning to the start line. If you don’t toss well into #1, your turn is over. This repeats with each number of the hopscotch course, and the winner is the person who has completed all of the courses wins. If you step on any lines or lose your balance, your turn is over. Also, if you step on a crack, you will break your mother’s back. This message has been brought to you by the sunshine, fresh air, and mosquito bites. We now return you to your regularly scheduled summer. This was not my idea, but it was so good I had to make one for ourselves. An un-official summer to-do list, complete with a bunch of ideas to turn to when we wake up and say, "what are we going to do today so that no one kills each other?" We quickly scribbled some ideas after they got home from their last day of school yesterday, and I hope to keep adding to it as we come up with other dreams and plans for our days in the sun and nights under the stars. Last night we sat around our annual last-day-of-school campfire, ate our favorite popcorn, and my daughter learned a C and an F chord on the ukulele. My son learned the in's and out's of a harmonica. It was one of those nights that was so perfect, I can't get myself to actually cross those items off our list... I want more.